Dividend growth investing is a remarkably effective strategy. In order to find the best dividend growth stocks, evaluating the company's track record of dividend payments is not enough. Factors such as dividend payout ratio and total capital distributions say a lot about a company's ability to sustain dividend growth into the future. Presenting a quantitative system based on dividend growth stocks with a strong potential to continue raising dividends. A system such as this one can be a valuable tool to identify promising ideas for further research among top-quality dividend growth stocks. Dividend growth investing is a simple and effective investment strategy. To begin with, there is plenty of academic research proving that dividend growth stocks tend to outperform the market in the long term. The table from Hartford Funds, based on data from Ned Davis Research, shows how dividend growth is a key return driver. According to this data, companies that consistently raise their dividends tend to outperform the market. Such as important, companies that cut their dividends underperform by a wide margin. 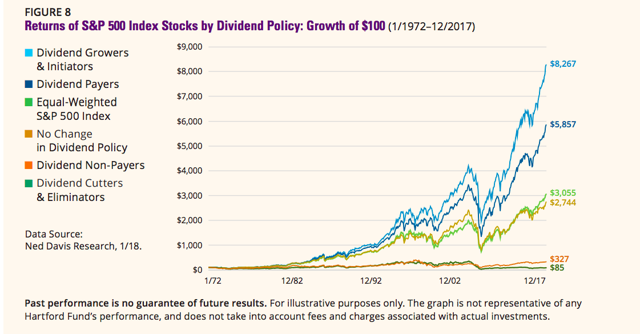 An image is worth a thousand words, and the chart shows that investing in dividend growth stocks can have a major impact on investors' net worth over the long term. It's easy to understand why dividend growth is such an effective return driver. While accounting earnings can be easily manipulated by management, dividends are paid in cold hard cash, making dividends a far more transparent measure of fundamental value. When a company rewards investors with consistently growing dividends, this is indicating that the business generates more cash than it needs, which is a clear sign of underlying fundamental quality. The investor's chief problem-and even his worst enemy-is likely to be himself. Investors can many times be hurt by their impulses and emotions, often buying and selling too quickly. It's easier to avoid these mistakes and hold on to high-quality companies over the long term when you see that dividend payments are consistently increased year after year. Consistent dividend payments reward investors for their patience, and they also provide a clear indicator by which to measure the fundamental health of the business. In a nutshell, dividend growth companies tend to offer superior fundamental quality, and it's generally easier for investors to hold on to companies with consistent dividend growth. Considering these factors, it's easy to see why dividend growth investing is such a popular and effective strategy. The quantitative system begins with a screener that eliminates over the counter stocks and companies with a market capitalization of less than $200 million. This is to guarantee a minimum level for size among companies in the investable universe. The screener then filters for only companies with a dividend yield above the industry average. A dividend yield of 3% is quite high for a tech stock but mediocre for a utility. Since dividend yields vary substantially across industries and sectors, the system looks at yields from a relative perspective. It's important to keep in mind that the main factor in this system is dividend growth, not dividend yield. However, it still makes sense to require the dividend yield to be above the industry average in order to avoid stocks with minuscule dividend payments. The system also requires the dividend growth rate over the past three years to be above 10% annually, so companies in the system need to be raising their dividend payments at a vigorous rate. A good track record of dividend growth is important, but the ability to sustain dividend growth into the future is even more relevant. In that spirit, the dividend payout ratio is required to be below 60% to guarantee that the company can comfortably continue raising dividends in the years ahead. Among the companies that meet the specified criteria, the system then selects the 25 stocks with the highest shareholder yield, meaning dividends plus buybacks and debt cancellations as a percentage of market capitalization. When companies have excess cash they can distribute that cash in three different ways: dividends, share buybacks, and debt cancellations. 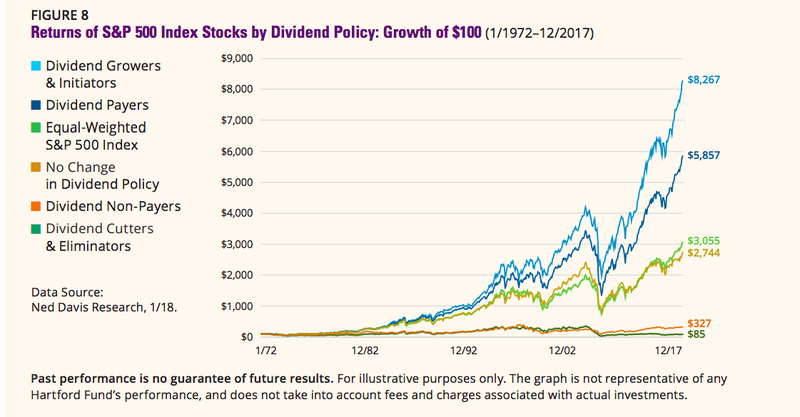 For this reason, looking at shareholder yield as a comprehensive metric of cash distributions can provide a broader look at the big picture in comparison to dividends alone. Over the counter stocks and companies with a market capitalization below $200 million are excluded. The dividend yield has to be above the industry average. The average dividend is required to be above 10% annually in the past 3 years. The payout ratio has to be below 60% of current earnings. Among the companies that meet the criteria above, the system selects the 25 names with the biggest total cash distributions in terms of shareholder yield. The backtesting assumes that the 25 in the portfolio are equally weighted and the portfolio is rebalanced every four weeks. Trading expenses are assumed to be 0.2% per transaction, and the benchmark is the Vanguard Dividend Appreciation ETF (VIG). 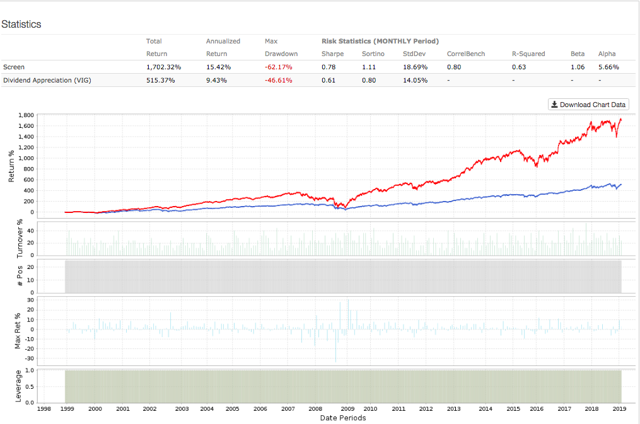 Since January of 1999, the quantitative dividend growth portfolio gained 15.42% per year, significantly outperforming the Vanguard Dividend Appreciation ETF and its annual return of 9.43% in the same period. System Alpha amounts to 5.66%. According to this data, a $100,000 investment in the Vanguard Dividend Appreciation ETF in January of 1999 would currently be worth around $615,000, and the same amount of capital allocated to the portfolio of dividend growth stocks recommended by the quantitative system would have a much larger value of $1.8 million. Offering more information, the table below shows return numbers over different time frames, as well as risk-adjusted performance metrics for the quantitative system versus its benchmark. There are some important caveats to consider. Unlike the Vanguard Dividend Appreciation ETF, the quantitative system does not include any criteria for sector diversification. This means that the quantitative portfolio can be substantially exposed to sector concentration risk. This is a particularly relevant factor to consider right now, because 11 of the 25 stocks in the portfolio as of the most recent update are in the financial sector. For better or for worse, whatever happens to financials in the coming months will have a considerable impact on the quantitative dividend growth portfolio over the middle term. The portfolio is much more concentrated than the benchmark, and it also has more exposure to relatively smaller stocks. This means that the quantitative dividend growth portfolio is more volatile and risky. This is well reflected in the backtested performance numbers. 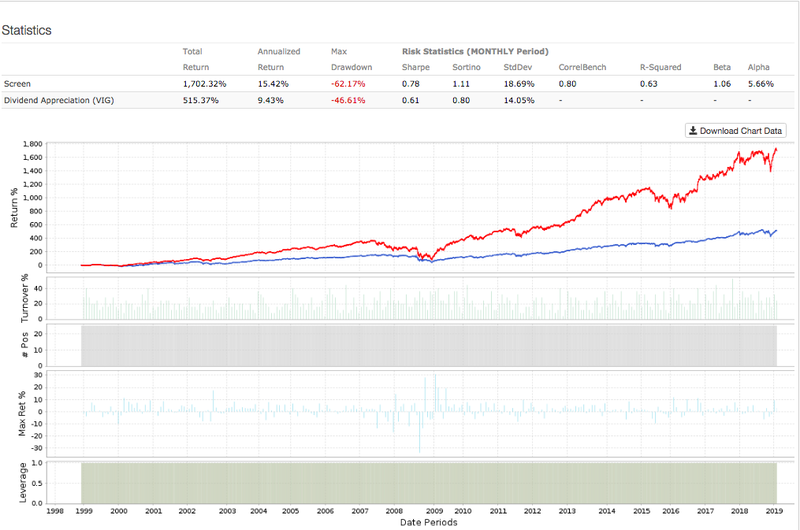 The system beats the benchmark in terms of returns and risk-adjusted return metrics such as Sharpe and Sortino ratios. However, if you look at risk metrics alone, such as volatility and maximum drawdown, the system is clearly riskier than the benchmark. The system is purely quantitative, so it necessarily has some flaws. For example, some companies may have unusually strong dividend metrics due to a special dividend or an unusually high increase in dividends in a particular period. When this happens, strong dividend growth in the past does not mean that such dividend growth can be sustained going forward. The main point is that investors should not automatically replicate a quantitative system such as this one. Rather, the system should be used as a source of interesting ideas for further research. The research process starts with the quantitative system, it does not end there. Those limitations being acknowledged, the table below shows the 25 stocks currently selected by the quantitative system. Data in the table also includes market capitalization - in millions - and dividend yield for the names in the portfolio. Capitalize on the power of data and technology to take the guesswork out of your investment decisions. Statistical research has proven that stocks and ETFs showing certain quantitative attributes tend to outperform the market over the long term. A subscription to The Data Driven Investor provides you access to profitable screeners and live portfolios based on these effective and time-proven return drivers. Forget about opinions and speculation, investing decisions based on cold hard quantitative data can provide you superior returns with lower risk. Click here to get your free trial now.